SIGN UP FOR AN ISIC CARD AND START SAVING WITH STUDENT DEALS!!! As a benefit of being a member of LOCAL 9 of the Canadian Federation of Students (CFS), you are eligible to get your International Student Identity Card for free! Search ISIC Canada’s thousands of discounts! You’re a student and you want to save money. ISIC has got you covered. You could start saving on products from brands like Adidas and Dell and sites like Amazon right away! You could check out Addition Elle or Garage for fresh fashion finds, then fill your that new suitcase you ordered online from Bentley. Book a room at a Days Inn, Travelodge, or the Quality Hotel for a little staycation or see the beauty of Canada with a ride on VIA Rail as you check out the online discounts available for software from companies like IBM. This is just the beginning. To search the thousands of discounts available to you, click explore discounts and find exactly what you’re looking for. Easy as that! 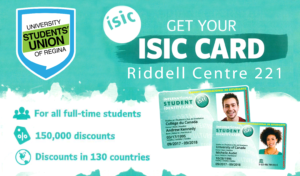 The ISIC card allows students the world over to prove their official student status and make the most of thousands of targeted student benefits and discounts in over 130 countries. Developed to help nurture cross-cultural understanding and international exchange, the card originally provided students with access to exclusive discounts on travel opportunities, allowing cardholders to discover and interact with new countries, cultures and languages at reduced rates. Although travel benefits will always remain central to the card, ISIC cardholders also gain preferential and discounted access to over 150,000 products, services and experiences relevant to all aspects of student life. There are a multitude of offers available to ISIC cardholders, from educational courses, software licenses, digital communications, public transport and magazine subscriptions, to music streaming, cafés and eateries, music festivals, theme parks, sporting events, world heritage sites and more! The ISIC card has been endorsed by the United Nations Educational, Scientific and Cultural Organization (UNESCO) since 1968. The card is recognized by universities, academic institutions, student unions, national governments, financial institutions and ministries of education around the world.